It starts in late August. That’s when I usually spot the first few dry, brown leaves cascading to the ground. They are an early cue of the changes afoot that eventually will cause some birds to depart for warmer climates, insects and animals to seek shelter for hibernation, and many trees to shed their leaves. Within weeks, vibrant fall colors begin to flare. Pumpkins are prominently displayed, perfectly potted mums adorn doorsteps, apple picking becomes the weekend activity of choice, and fall festivals get underway. Locals and tourists flock to the woods on foot, on bikes, and in vehicles to bask in the beauty of the brilliant blue skies infused with ever-changing colors that are at their purest when nature-made. Before long, those alluring leaves become crisp, dull, darkened shadows of their former selves and begin the coat our grounds. The rakes come out in force to collect and dispose of the withered leaves that many believe have served their purpose. Except the leaves haven’t quite finished their job. Fall leaves can actually be beneficial for your lawn, garden and wildlife. In an area where many feel compelled to maintain perfectly manicured lawns and picturesque gardens, leaves are often bundled up in bags and hauled away, using more resources and energy and creating more pollution. In the City of Alexandria, we are fortunate to have so many options for handling our leaf waste in environmentally beneficial ways. From a composting tutorial to curb side pickup, to the distribution of paper leaf collection bags, the city encourages residents to use these alternatives before putting leaf waste to the curb in plastic trash bags. When leaves stay on your property, the city uses fewer resources by negating the need to haul them away. Leaves from a healthy tree or plant that are left in a garden or in a leaf pile over winter break down into leaf mold, providing a nutrient rich soil topping that is beneficial for organisms above and below the surface. Your spring plants will love it! By allowing leaves to decompose in your lawn or garden, you’ll create a mulch covering that will help to protect plants from frost and keep weeds down. Leaves on your lawn can be mowed over a couple of times and then left to nourish the grass and retain moisture. Whole small leaves or shredded large leaves left in a bag over the winter to break down create a wonderful mix that can be added to your compost tumbler or compost pile as brown matter that’s needed in combination with green matter for a healthy compost mix. While it’s tempting to strip away all dead matter for curbside appeal, flower stalks, leaves, and other dormant plants life left in the garden provide much needed food and shelter to small animals, insects and beneficial microorganisms. Before you grab your rake and bags for fall cleanup, consider how you can make better use of nature’s bounty. Even in our cozy little backyard, we created a space for leaves and brush and you can too! 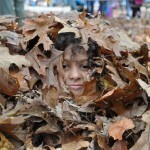 Whatever you ultimately do with your leaves, take some time to have a little fun with them. Make a pile and take a dive!